It occurs to me that I’ve never published my slides from the talk before so I’ve uploaded them as a PDD today (minus the video demos). You can download the slides here. However, for me the best part of the night was a surprise presentation from the Irish Federation of Astronomical Societies (IFAS). I had absolutely no idea there was anything special going to happen after my talk. I was delighted to see the chair person of IFAS at the talk, but I had no idea he had an ulterior motive, let alone that that motive was to present me with an absolutely wonderful gift as a thank-you for my work on www.irishastronomy.org over the years. As anyone who was there can testify to, I was literally lost for words … ME … lost for words! 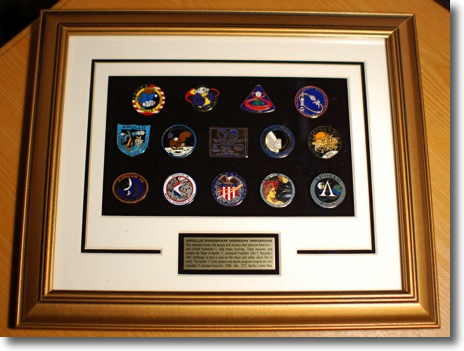 They gave me a framed collection of pins of all the mission patches for all the Apollo missions. It’s absolutely fabulous and it will take pride-of-place on my desk. I just can’t thank the guys in IFAS enough. It’s unbelievably wonderful. 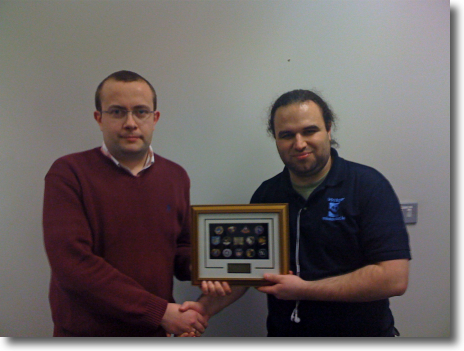 Below is a quick snap of the IFAS chair Michael O’Connell presenting the patches snapped with my iPhone by a helpful Astro2 member, and below that is a picture of the framed patches (not taken with the iPhone!). oh my gosh Bart, this is incredible. I’m so glad they acknowledge your work on irishastronomy.org, I know you poured your heart into that. To be thanked is one thing, this set of pins is absolutely priceless. I would have paid good money to see you speechless, and to see how happy this must have made you. Congratulations!